The Dashboard page summarizes statistics for your website. Use this information to quickly evaluate traffic dynamics, traffic sources, the quality of pages on the site, and more. Statistics are shown in widgets. To analyze data, you can change the time period to display and itemize the data. Displays dynamics of data over the selected period. For example, changes in the number of users over a month. Displays data by group. 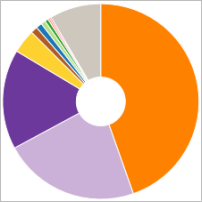 For example, the number of users, grouped by source types (direct hits, search engine traffic, and referrals from other sites). You can use ready-made widgets that are provided in the widgets library, or create custom widgets and configure them. Evaluate the quality of website pages. Get information about conversions and the conversion rate. Evaluate the effectiveness of traffic and its sources. Check the speed of the website. If these widgets don't provide enough data, you can create new widgets with the settings you need. Click Create widget and select the desired type (for example, a graph). A new widget appears on the page. By default, this widget already contains a set of parameters. To change them, click . 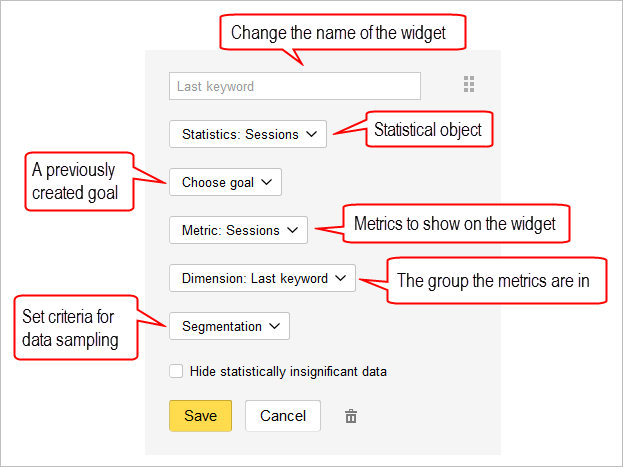 For example, you can use the settings to make the graph show dynamics of sessions only from Yandex Search — segment sessions by traffic source. For more information, see Obtaining and displaying data. Metrics.